Summary: Are we alone in the universe? Going back to ancient astronomers, this book quickly traces the history of what humans have learned about the place of Earth in the galaxy. It then details how scientists are looking for a “just right” planet–not too big, not too small, not too hot, not too cold–that might support life. Huge telescopes sitting on mountaintops or floating through space gather information on stars and the exoplanets around them. 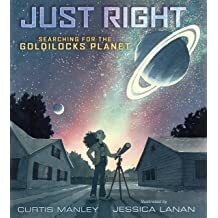 The illustrations show a girl and her family visiting a planetarium, then getting her her own telescope as she learns about the universe. The last several pages speculate on what life on other planets might be like, and how we might communicate with those life forms. Includes a page of additional information; a bibliography; books and websites with additional information; and a timeline of space exploration on the front and back endpapers. 48 pages; grades 2-5. Pros: Packed with scientific information, the author does a great job of making a complicated topic accessible to elementary kids; the illustrations of the girl and her family help make it kid-friendly as well. Cons: Some of the information was a bit over my head…but readers will still find something interesting, even if they don’t understand it all.